The colour composite of a RADARSAT-2 polarimetric radar image data acquired over the Netherlands on April 4th, 2009 as part of the lead-up to the Sentinel-1 European Radar Observatory program. The different colours reflect the type and condition of the land cover. Field boundaries are clearly visible in this area, which is mostly agricultural. The dark areas correspond to water surrounding this area of reclaimed land, the very bright areas to urban settlements and the pink/blue area to middle-left is a nature reserve. The RADARSAT images were taken to familiarize European Space Agency (ESA) researchers with synthetic aperture radar (SAR). Photo c/o Geospatial Data Services Centre & MDA. As outlined in the February 19th, 2015 Ottawa Citizen story, "Ukraine gets Radarsat imagery while Canadian military faces shortages of data," the DND, which is required to pay for RADARSAT-2 Earth imaging from satellite owner MacDonald Dettwiler (MDA), will soon be running out of money to support the Earth imaging requirements of ongoing Canadian military and government operations. As outlined in the article, federal departments were originally allocated $445Mln CDN worth of data collected by the Radarsat-2 satellite, at an agreed upon commercial rate, in exchange for the government’s financial contribution to the building of the MDA owned satellite. But the data derived through the synthetic aperture radar (SAR) used by RADARSAT-2 has been steadily growing, from an average of 3.5 minutes per orbit in 2008 to an average of 10.8 minutes per orbit in 2013, and the Canadian military has certainly been using more than its intended share. ...the spacecraft has become so essential, particularly for the Canadian military’s surveillance of the country’s coastlines, that the federal government is fast using up its data credits. Unless the government provides more money, it will use up its allotment of surveillance time by the summer of 2017, according to the 2012 records obtained by the Citizen using the access to information law. The federal government has indicated that the RADARSAT-2 data to be sent to Ukraine will be paid for out of the existing DND data credit allocation. Of course, the Canadian government is certainly not a monolithic organization (despite what the political opposition might believe about the current federal government under prime minister Stephen Harper) and other government departments are moving in different directions to insure that their research into Earth imaging technologies remains relevant. For example, the CSA has recently issued a request for information (RFI) on space-based AIS data services (9F013-140805/A), no doubt intended to bring the agency up to speed on some of the private sector initiatives related to space based automatic identification systems (AIS), which are being commercially rolled out now by companies like Cambridge, Ontario based exactEarth Ltd.
AIS began as an automatic tracking mechanism for collision avoidance used on ships and by vessel traffic services (VTS) for identifying and locating nearby vessels by electronically exchanging data. But recent advances in technology have allowed AIS signals to be tracked by satellite and compiled into centralized, virtually real time location plots, which leads naturally to a whole series of new uses relating to customs enforcement, anti-piracy activities and national security. Here's hoping the CSA gets up to speed on the topic quickly. Other governments don't always issue RFI's to collect information. New UrtheCast board member Letitia A. "Tish" Long. Photo c/o CNN. An example of this would be the February 23rd, 2015 Canadian News Wire press release, "UrtheCast Appoints New Board Member Letitia "Tish" Long, Former Director Of The National Geospatial-Intelligence Agency," which focused on the newest board member at Vancouver, BC based UrtheCast and her connections to some of the darker recesses of the US intelligence and military communities. 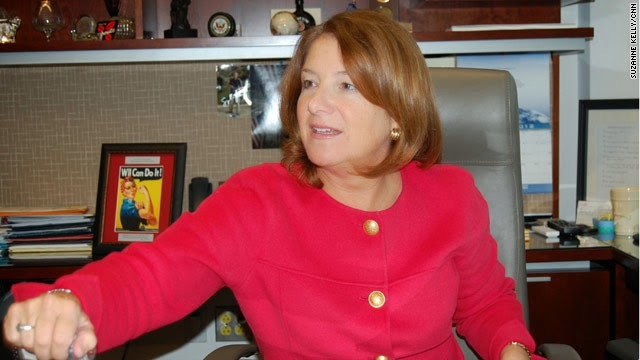 Prior to her retirement as director of the National Geospatial-Intelligence Agency (NGIA) in October 2014, newly appointed UrtheCast board member Letitia A. "Tish" Long served as the deputy director of the Defense Intelligence Agency (DIA), the deputy Under Secretary of Defense for Intelligence (policy, requirements, and resources), the deputy director of naval intelligence and the executive director for intelligence community affairs at the Director of Central Intelligence (DCI). 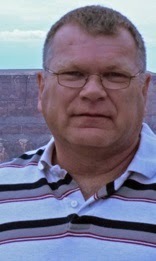 And, as outlined in the NGIA website, Long's last job was to manage the provision of "timely, relevant, and accurate geospatial intelligence in support of national security" to both the US Department of Defense and the US intelligence community, a grouping of 17 separate US government agencies. These organizations use NGIA derived data to conduct intelligence activities (including espionage), contribute to military planning and perform other activities considered necessary "for the conduct of foreign relations and national security." Is that a great resume or what? In real estate, it's all about location, location, location. Space weather research works the same way. Canada takes a leading role in this research because of our position under the northern auroral oval, a region around the northern geomagnetic pole. A sample measurement, taken on November 9th, 2013, of the northern auroral oval, a region of heightened atmospheric activity centered around the North magnetic pole. The variations in the northern atmosphere, and its interaction with solar storms, often generate atmospheric disturbances and visible auroras (the Aurora Borealis, or "Northern Lights"), which provide scientists with an opportunity to study space weather and solar disturbances. Graphic c/o NOAA. Predicting solar disturbances accurately is critical. 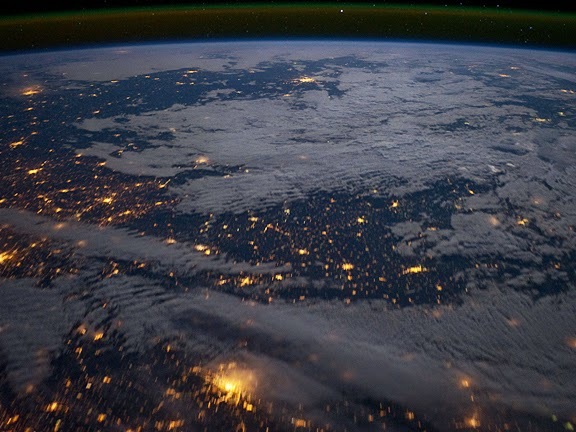 These disturbances can damage satellites, spacecraft, communications, and power grids. Canada's proximity to the northern magnetic pole gives us a front-row seat for studying space weather, but it also makes us vulnerable. We got an unpleasant taste of how vulnerable we were during the massive Hydro-Quebec blackout in 1989. As outlined in the March 13th, 2009 NASA website article, "The Day the Sun Brought Darkness,"the entire province went dark for 12 hours. For the most part, our space weather research involves five Canadian universities working in partnership with Natural Resources Canada (NRCan), the Canadian Space Agency (CSA), and the National Research Council (NRC). Other universities and industry players contribute as well. An overview of the effects of space weather conditions on terrestrial facilities. 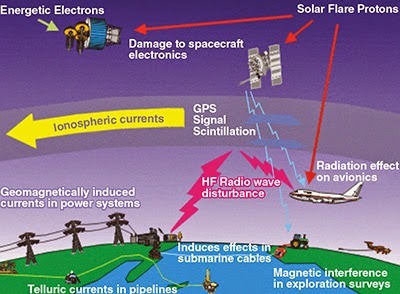 As outlined in the Autumn 2014 Canadian Military Journal article, "Space Weather, Situational Assessment and It's Effects upon a Joint Interagency Domestic and Arctic Environment," these effects can impair satellite hardware and solar cells, de-orbit satellites, disrupt radio transmission and GPS signals and even render entire power and communication networks inoperative. Graphic c/o Space Weather Canada/Natural Resources Canada. The various projects come together in the Canadian Geospace Monitoring Program (CGSM). The participants use a variety of specialized tools to monitor and study space weather. The data collected by CGSM is available to scientists through the Canadian Space Science Data Portal (CSSDP). Cybera, an Alberta-based, not-for-profit technical agency acts as the project lead. DRAO John A. Galt telescope. Photo c/o NRC. The Cawston, BC based Dominion Radio Astrophysical Observatory (DRAO) where NRC, through the world renown Herzberg Institute of Astrophysics (NRC-HIA), has operated an automated solar radio flux monitor, focused on collecting 10.7 cm data widely used for “space weather” applications to measure the effects of solar activities on communication technologies, since 1960. Other DRAO facilities include the John A. Galt Telescope, a 25.6 m, prime-focus, equatorial-mounted, single-antenna telescope and the Synthesis Telescope, which offers wide-field imaging and atomic hydrogen (HI) spectroscopy, which makes it particularly useful for studies of the interstellar medium and nearby galaxies. The University of Alberta (U of A) and NRCan, which use flux gate magnetometers to measure the buildup and release of energy in Earth's magnetosphere, an area that expands up to 70,000 km above Earth. The data helps spot space storms that could affect spacecraft operations. This is part of the Canadian Array for Realtime Investigations of Magnetic Activity (CARISMA) project. U of A also uses induction coil magnetometers to measure changes in the magnetic field. The university also hosts the annual Canada-Norway Student Sounding Rocket (CaNoRock) exchange program, a partnership between the universities of Alberta, Calgary, Saskatchewan, Oslo, Tromsø, the Andøya Space Center and the Norwegian Center for Space Related Education (NAROM). As highlighted in the February 19th, 2015 Edmonton Journal article, "U of A physics student’s science experiment rockets into space storm over Norway," CaNoRock program members collaborate on a variety of scientific experiments relating to space weather and upper atmosphere research. CGSM instrument configuration as per 2009. Graphic c/o CGSM. The University of Calgary (U of C), which uses a variety of "all-sky imagers," or digital cameras to capture the light of auras, as part of the Time History of Events and Macroscale Interactions during Substorms (THEMIS) program. The data collected tells researchers where charged storm particles entering Earth’s upper atmosphere have come from. U of C also uses meridian-scanning photometers, to pick up the auroral colours that imagers can’t see. U of C also leads the science component of the Enhanced Polar Outflow Probe (e-POP), one of the experiments on board the CAScade, Smallsat and IOnospheric Polar Explore (CASSIOPE) satellite. The eight scientific instruments making up e-POP collect data on space storms and plasma flow to help scientists understand solar weather and plan measures to mitigate its deleterious effects. 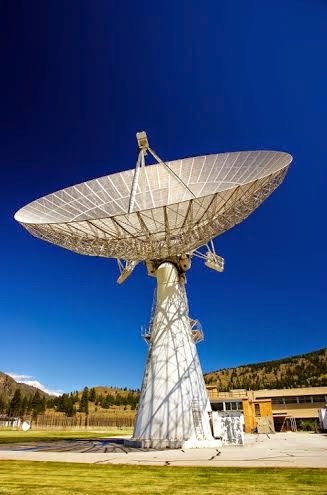 In conjunction with NRCan, and as part of the NORthern Solar Terrestrial ARray (NORSTAR) project, the U of C uses relative ionospheric opacity meters (riometers) to observe how cosmic background radiation affects radio communications. 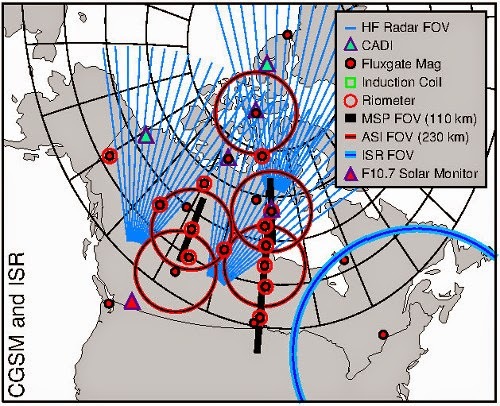 As outlined on the Canadian Space Science Data portal, the NORSTAR program operates single-beam single-frequency riometers at thirteen sites in north-central Canada. The University of New Brunswick (U of NB), which uses high-frequency radars called ionosondes to study the different layers in the ionosphere, a region about 60 km to 600 km above Earth as part of its contribution to the Canadian High High Arctic Ionospheric Network (CHAIN). U of NB also uses GPS receivers to observe signals from navigational satellites. These devices help researchers understand how ionization interferes with radio communications and navigation. 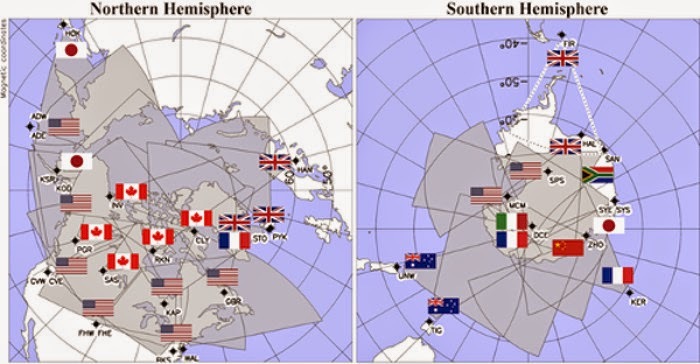 SuperDARN radar locations in the northern and southern hemisphere. The field-of-view of each active radar is coloured in grey. Graphic c/o Virginia Tech SuperDARN group. The University of Saskatchewan (U of S), which runs SuperDARN Canada, part of the International Super Dual Auroral Radar Network (SuperDARN) project. SuperDARN has more than 30 high-frequency radars in the northern and southern hemispheres mapping plasma flow in the ionosphere to track space weather issues. The University of Waterloo (U of W), which, along with the U of A, runs computer modelling and simulations from CGSM data to develop accurate space weather forecasts. In addition to the work done through CGSM, NRCan operates the Canadian Space Weather Forecast Centre (CSWFC) in Ottawa, which is part of Space Weather Canada. The organization monitors and researches space weather in co-operation with other government agencies, academia, and industry. 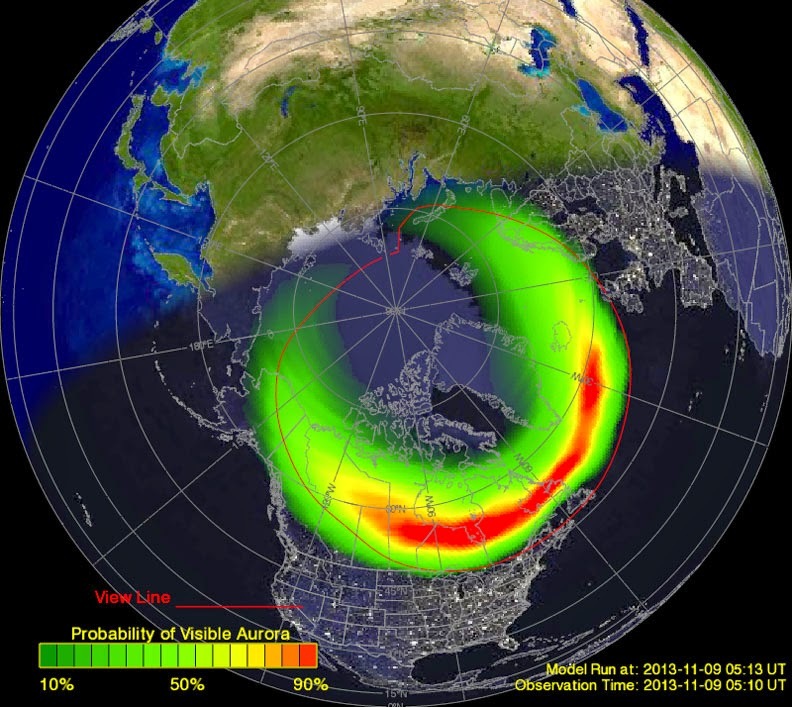 CSWFC also develops forecasts and monitors the effects of geomagnetic storms on power systems, pipelines, satellites, HF communication, and GPS navigation. It shares data with the CSA, the International Space Environment Service (ISES) and the World Meteorological Organization (WMO). As well as working with NRCan to improve techniques for predicting space weather, the CSA provides a large part of the funding for many of the space weather projects. Of course, this article is not a comprehensive listing of all space weather research in Canada. Covering the subject in detail would require a much longer article. What should be clear, though, is that Canada plays a key leadership role in space weather research. We provide expertise, funding, data ... and location, location, location. The Canadian government has announced that it will provide Ukraine's military with high-resolution satellite imagery from RADARSAT-2. Eastern Europe at night. An Expedition 29 crew photo taken from the International Space Station (ISS) in October 2011 from an oblique angle. The image includes Budapest, Hungary in the foreground (center left) and Kiev, Ukraine in the distance (top center). RADARSAT-2, which uses a synthetic aperture radar (SAR) capable of multiple polarization modes with a highest resolution of one metre in spotlight mode (three metres in ultra fine mode), is able to show far more detail and cut through cloud cover. Photo c/o NASA. As outlined in the February 12th, 2015 Globe and Mail article, "Canada to give satellite imagery to Ukrainian military," the deal will greatly sharpen Ukraine's battlefield awareness in their year-long war against Russian-backed separatists which has claimed over 5,000 lives. The move has precedent and highlights space technology's use as a political tool rather than one of science or commerce. 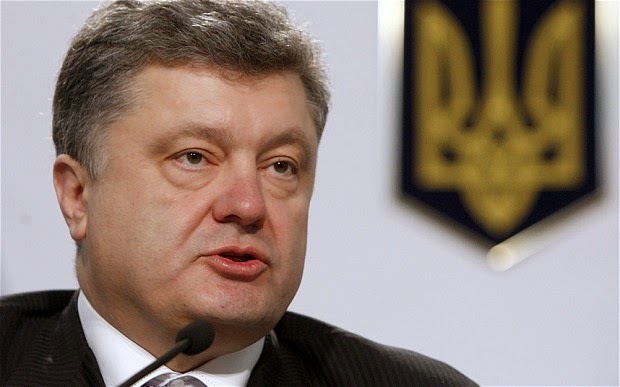 The deal stems from a June 2014 visit to Canada by Ukrainian President Petro Poroshenko during which he requested access to Canadian satellite imagery. Petro Poreshenko. Photo c/o The Telegraph. As part of the deal, Canada will provide Ukraine with data from RADARSAT-2, a synthetic aperture radar satellite launched in 2007 and operated by Richmond, BC. based MacDonald Dettwiler (MDA) on behalf of the Canadian government. RADARSAT-2 is used for coastal surveillance, surface ship tracking, land use analysis/mapping and pollution monitoring. The satellite can monitor Earth day and night in all types of weather. The deal was made public on the same day (Feb 12th) that a new ceasefire agreement, brokered by Germany and France and intended to de-escalate the fighting in eastern Ukraine, was reached by Ukraine and Russia. As of Feb 17th, however, fighting continues along the Ukraine/Russia border and both sides have refused to withdraw their heavy weaponry until the other side does first. The Canadian government had apparently intended that Ukraine utilize the imagery defensively i.e. to verify that Russia was honouring the terms of the ceasefire (i.e. by withdrawal of its heavy weaponry) and to efficiently deploy troops to counter separatist attacks. With the apparent failure of the ceasefire and continuance of the war, however, Ukraine's military might now use the RADARSAT-2 imagery to go on the offensive by targeting separatist troops and artillery. According to the Globe & Mail article, this possibility triggered a dispute among officials in the Department of Foreign Affairs, Trade and Development who opposed sharing the data. In a gesture to mollify its critics, the Canadian government has stipulated that Ukraine is to use the imagery for defensive purposes only. Of course, the specifics of how this provision is to be enforced has not been made public. Satellite imagery has played a significant role in the Ukraine conflict. In August 2014, NATO made public satellite images showing troop staging areas along the Russia/Ukraine border as well as sophisticated Russian heavy weaponry (artillery, rockets, and missiles) crossing into Ukraine—refuting Russian claims that it is not supplying the separatists and that Russian soldiers in Ukraine are volunteers. An historical example of shared satellite imagery includes the 1982 Falklands War. 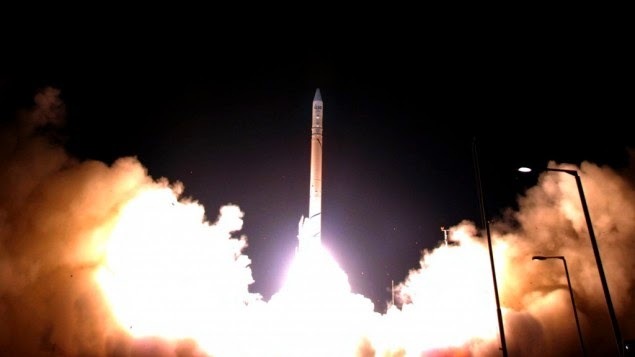 During that conflict, as outlined in the March 11th, 2013 Space Review article, "The Lion and the Vortex," the US provided the UK with both satellite imagery of the islands as well as signals intelligence-both instrumental to the UK's victory. Satellites remain a double-edged sword; despite their power to bring us together and expand our knowledge of the universe, they are just as often used for less noble pursuits. 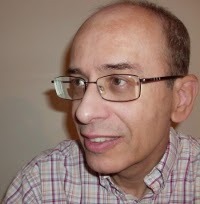 Andre Dupuis. Photo c/o SSCL. A new Canadian start-up, focused on providing the knowledge needed to understand and work effectively with the legislative, regulatory and operational requirements surrounding current space missions, is hoping to parlay its extensive knowledge of those areas into a sustainable, private sector, consulting business. 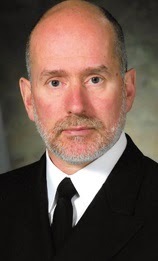 At least that’s the intent of retired Canadian Forces (CF) Colonel Andre Dupuis who, until recently, acted as director of space requirements at the Department of National Defence (DND). Since retiring in July 2014, Dupuis has taken on a new role as the president and CEO of Space Strategies Consulting Ltd. (SSCL). 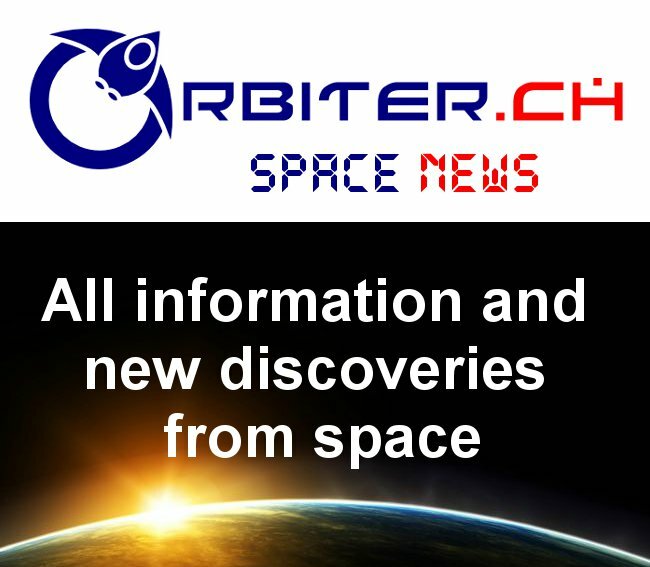 “Our role in this new company is to match up operational end-users of space technology in the government and private sectors with scientists, engineers and others who can help those end users to more effectively accomplish their mission,” said Dupuis, during a recent interview. In essence, SSCL is intended to serve as a facilitator and translator for scientists and engineers to help them understand the jargon, context and subtext often associated with military, government and private sector procurement requirements. SSCL will be holding a seminar focused around an "Introduction to Space Applications," from March 30th - 31st in Ottawa, Ontario. As outlined on the SSCL website, the course is targeted at mid level public servants and others whose duties require an understanding of the complexities of the space environment from a regulatory and operational perspective. Topics covered will include the space economy, civil space (with emphasis on Canadian Space Agency requirements), national security space (with emphasis on DND requirements), the international space policy environment, space mission design, space sciences and exploration, satellite communications, surveillance of space requirements, Earth observation issues and satellite-based navigation. The course will also include an offsite visit to the Telesat Canada mission control centre plus a panel discussion with senior government space stakeholders. Graphic c/o SSCL. ESA, CSA, AGI & NASA. "We want to help people understand the paperwork and procurement people, and also help those procurement people to understand the technology so they can find the right tools to fulfill the mission," according to Dupuis. D. Bancroft. Photo c/o SSCL. Douglas Bancroft - With several decades of government service focused on the civilian and military applications of remote sensing, terrestrial monitoring, weather forecasting, operational oceanography, and maritime domain awareness, Bancroft has a proven record of connecting innovative experts to decision makers in industry and government. P. Boone. Photo c/o SSCL. Peter Boone - An ex-Royal Canadian Air Force (RCAF) career officer with two tours with the US Air Force Space Command in Cheyenne Mountain as an orbital analyst and crew commander, followed by a stint as manager of the space surveillance network and seven years in Ottawa as a requirements manager, exploitation manager and project director in support of DND projects, Boone is well versed on the operational and regulatory requirements surrounding both civilian and military space missions. G. Gibbs. Photo c/o SSCL. 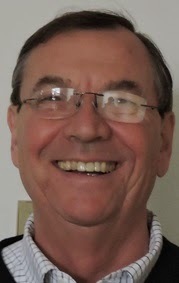 Graham Gibbs - The well regarded ex-Canadian counselor for space affairs and recently retired CSA representative to the US in Washington, DC is expected to help bring a measured, "political" perspective to any discussions he becomes involved with. Gabriela Gref-Innes - A 35 year veteran of Canadian government service, Gref-Innes' expertise resides in the field of international commerce, exports, government procurement and business development at a variety of government organizations, including Public Works and Government Services, the Canadian Commercial Corporation (CCC) and the Department of Foreign Affairs and Trade Development. All this expertise would certainly be useful to Canadian companies looking to market their innovations internationally. S. Hower. Photo c/o SSCL. 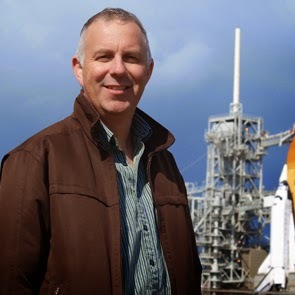 Scott Hower - As the owner and CEO of Colorado based Peak Space Solutions, Hower has been leading efforts to support US space security and defense programs by focusing on issues surrounding strategic shaping and deterrence issues. 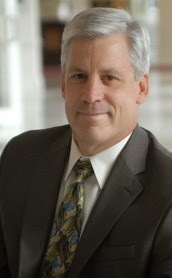 He is also a well known expert on space protection strategy, policy and doctrine, who has led large space operations programs and multi-million dollar space test activities relating to national security policy, technical analysis, missile warning/defense operations, offensive and defensive space control and situational awareness issues within a variety of government and business communities. All of which is a long winded way of saying that Hower brings a distinctly "American" perspective to discussions. Scott Jones - Another 35 year veteran of the Canadian Forces, Jones' career has focused around the creation, operational use and support of military space, missile defence and intelligence capabilities. His most recent role has been space policy and strategic planning at National Defence Headquarters. Jones has also worked as an acquisition liaison officer at the US National Geospatial-intelligence Agency (NGA), a missile defence planner and missile warning center commander at NORAD’s Cheyenne Mountain Operations Center and as the research and development coordinator for the RCAF. F. Pickney. Photo c/o SSCL. 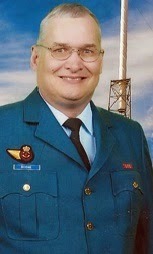 Frank Pinkney - With more than 25 years of space experience in planning, project management, and research and development, Pinkney has functioned as a space research engineer at the US Army Research and Development Engineering Center, the lead for space concept development and planning in the Directorate of Space Development (DSpaceD) and the leader of the Defence Research and Development Canada (DRDC) space systems group. According to Dupuis, his teammates at SSCL are a good group to get to know if you'd like to "get something done." The first real chance for those of us who haven't spent the last few decades in government service to do so, is an upcoming seminar focused around an "Introduction to Space Applications," which will be held by SSCL from March 30th - 31st in Ottawa, Ontario. For more information, please visit the SSCL website. 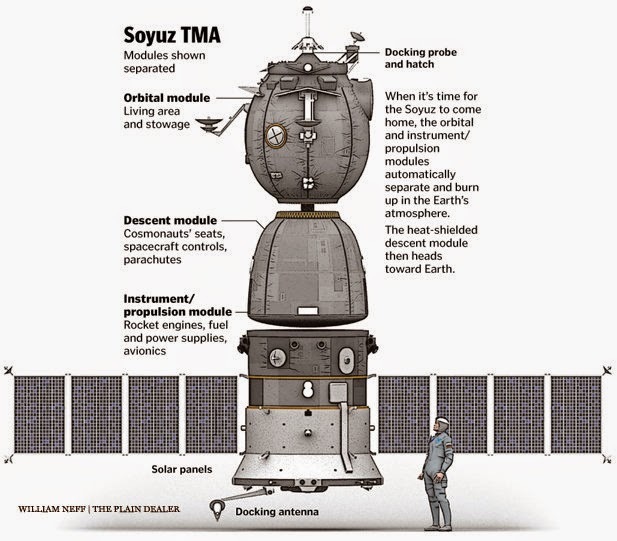 The Soyuz spacecraft. Image c/o William Self/ The Plain Dealer. NASA has issued a statement saying that it intends to purchase six seats on Russian Soyuz spacecraft to carry US, Canadian, European and Japanese astronauts to the International Space Station (ISS) and back to Earth in 2018. NASA said that the new Soyuz purchase is a contingency in the event that commercial space vehicles now in development are delayed. As outlined in the February 6th, 2015 Space News article, "NASA Issues Sole Source Notice for Six Soyuz Seats," the announcement was received with mixed emotions. “Given the current maturity level of the commercial vehicles and the 3-year procurement lead time for Soyuz crew transportation services, NASA must contract for Soyuz now in order to assure uninterrupted access to ISS in CY 2018,” NASA said in its statement. Under the terms of its last contract with Russian Federal Space Agency (Roscosmos), Soyuz seats cost approximately $76Mln USD ($94.77Mln CDN) each. Boeing and SpaceX are currently developing spacecraft (Boeing's CST-100 and SpaceX's Dragon/Dragon V2) to carry astronauts to the ISS on a commercial basis. The first flights of these vehicles are scheduled for late 2017. 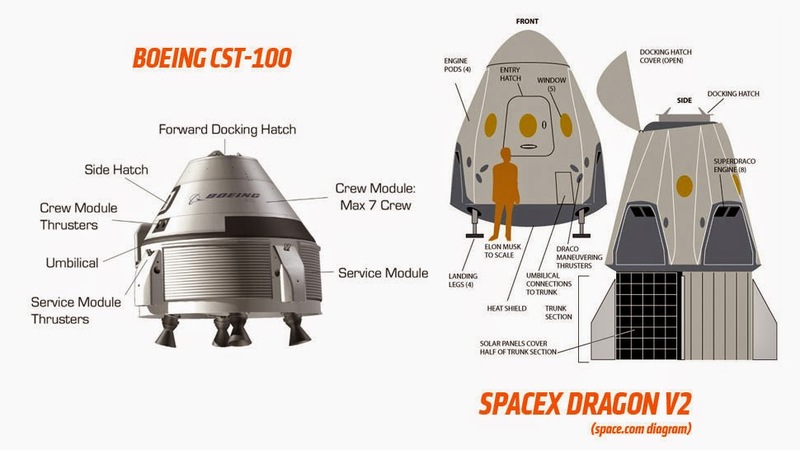 Boeing CST 100 and Space Dragon V2. Graphic c/o Space.com. Although space enthusiasts may be discouraged by this extended astronaut downtime, it is helpful to remember that similar lulls have occurred before. Canadian astronauts experienced an 8-year gap between Marc Garneau's 1984 mission and Roberta Bondar's 1992 flight. US astronauts had a 6-year gap between 1975's Apollo-Soyuz Test Project and 1981's first Space Shuttle flight. And when astronauts do resume their travels, it will be aboard new ships built by new players in a new paradigm for the industry. An unusual request for proposal (RFP), issued on February 3rd, 2014 by the Canadian Space Agency (CSA) for a complex joint study in conjunction with the Israeli Space Agency (ISA) focused around the "innovation and commercial potential" of a variety of satellite technologies, was initially to remain open for only two weeks before "up to two proposals" would have been awarded contracts worth up to $300,000 CDN, to further study the problem. The Israeli Shavit 2 rocket launching the Ofek-7 satellite into orbit on June 11th, 2007. Initially used in 1988 to carry the first Ofek satellite, the Shavit has a demonstrated ability to launch upwards of 300kgs into low Earth orbit. Ofek Earth imaging satellites and the Shavit rockets are both operated by the Israeli Ministry of Defence. Israel is considered the smallest county to possess an indigenous launch capability. Photo c/o Times of Israel. But after a series of inquiries from the Commercial Space blog, the period for response to the RFP has been extended out for another two weeks, until March 2nd, 2015. The RFP is currently available for viewing on the Public Works and Government Services Canada (PWGSC) Buyandsell.gc.ca website under the title of "Concept Study for a Canada-Israel Space Mission (CISM) (9F064-20140724)." As outlined in the RFP, the CSA, working in conjunction with the ISA, will select up to two proposals to begin work in early March for a period of five months. The contracted work will focus on the innovation and commercialization potential of novel techniques for maritime object localization and broadband telecommunications payloads with advanced on-board processing capabilities. All of which sounds kinda complex, given that there was initially only two weeks to assess, define and then reply to the RFP. With this new deadline, four weeks in total will be allowed to respond to the RFP. An initial list of technologies has also been identified as being of interest under the program. These include long-wave infrared cameras, digital communications, satellite formation flying technologies, software defined radio (SDR) capabilities and on-board propulsion systems. Argo J-5 rovers manufactured by Ontario Drive & Gear (ODG) being demonstrated at the University of Toronto Institute of Aerospace Studies MarsDome facility on February 20th, 2014. A single $600,000 CDN contract for the ExCore small planetary rover platform (9F052-140062/A), was published on July 30th, 2014 and closed off on September 22nd, A second, $300,000 contract for a lunar polar rover night survival strategy (LPRNSS) concept study (9F052-140125/A) was published on August 15th, 2014 and closed off on October 2nd. A third, $3.25Mln CDN contract for a lunar rover drive-train prototype (LRPDP) platform (9F052-140053/A) was published on July 11th, 2014 and remained open until September 12th. As outlined in the December 1st, 2014 post, "New CSA Rover Contracts Worth Over $3.28Mln CDN Uncovered," the final contracts were eventually awarded to ODG and MacDonald Dettwiler (MDA). Photo c/o author. Of course, the typical RFP process is geared to allow a longer response time in order to insure appropriate publicity and the full participation of a wide range of potential respondents. For example, unlike the current RFP, and as outlined in the August 18, 2014 post, "Canadian Space Agency Gears up to Fund More Rovers," three other recent CSA RFP's were each open for approximately six weeks before bidding closed off. As outlined on the Government of Canada webpage on Canada-Israeli relations, Canada and Israel have "strong, multidimensional bilateral relations, marked by close political, economic, social and cultural ties." This relationship is also supported through various bilateral agreements including the March 2005 Canadian Space Agency - Israeli Space Agency MOU for Space Cooperation agreement, which was updated in September 2014 and served as the basis for the current RFP. Why was this specific RFP initially allowing only two weeks for interested parties to craft a response? When CSA representative Julie Anselmo finally connected with the Commercial Space blog over the phone on Friday, February 6th, 2015, she indicated only that the original closing date for the RFP was "an error" which would be corrected formally early the following week. Editors Note: This article was originally published on February 4th, 2015 and updated on February 6th, 2015 after a short conversation between editor/ writer Chuck Black and Anselmo. It was further updated when the formal closing date of the RFP was changed on February 9th. Made in Space (MIS), a Silicon Valley-based start-up that built a zero-gravity 3D printer installed on the International Space Station (ISS) four months ago, says the first set of objects is complete and the preliminary results are good. 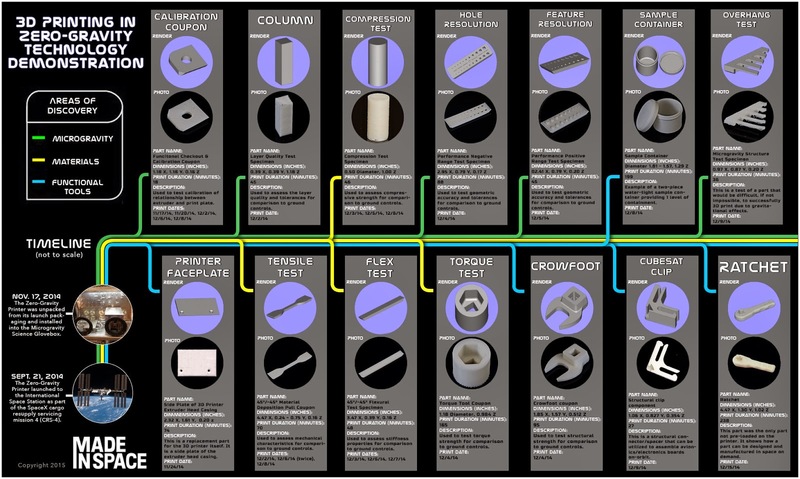 Graphic showing the parts that were printed as part of the 3D printing in zero gravity technology demonstration. Graphic c/o Made in Space. According to a Jan 27th, 2015 Made in Space blog post, "3D Printing In Space: Four Months In," the printer created fourteen unique objects over the course of the experiment. These ranged from objects designed to test the printer's accuracy at creating features like holes and overhangs, to a part for the 3D printer itself (a faceplate), to an actual working tool: a small ratchet. The ratchet's design file was even emailed to the ISS to be printed; the first time in history that this has been done in space. The printed objects will be brought back to Earth later this year and sent to the NASA Marshall Space Flight Centre in Alabama for analysis and stress testing. The use of 3D printing technology in space, though still in its earliest stage, is poised to make a big impact. Space-based 3D printers would give astronauts the ability to manufacture tools and components on-site without needing to bring them along, with significant savings on space, weight and fuel. In addition, the ability to manufacture objects in space would give astronauts greater options in unforeseen situations like malfunctions and accidents. In a sign of the technology's potential, the US Navy is also experimenting with 3D printers, installing them on combat ships to see if they can be used to produce tools, components and weapons. MIS was founded in August 2010 by Aaron Kemmer, Jason Dunn, Mike Chen, and Michael Snyder, who all met while taking part in the graduate studies program at Singularity University (SU), a private, unaccredited learning institution/space start-up accelerator located at the NASA Ames Research Centre in Moffett Field, California. Also located at Moffett Field, MIS was one of the first startups to emerge from SU. MIS' goal is “enabling humanity’s future in space,” by developing additive manufacturing (i.e. 3D printing) technology for use in the space environment. By creating an additive manufacturing capability in space, MIS seeks to accelerate and expand space development. The emailing of an object to a space station for manufacture in orbit, which would have seemed the most Star Trekkian of fantasies 20 years ago, is now reality. In the coming decades, we might gaze in wonder at 3D-printed solar arrays, space stations and spaceships; more science fiction marvels brought to life. Burnaby, BC based D-Wave Systems has announced that it has raised another $29Mln CDN to fund further development of the unique quantum computing hardware and software developed by the company. 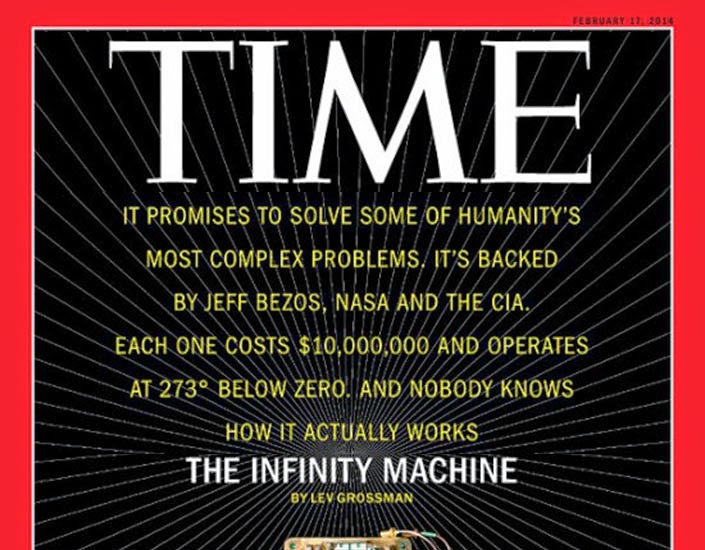 D-Wave on the February 17th, 2014 cover of Time magazine under the title "The Infinity Machine." The Commercial Space blog first profiled D-Wave in the July 1st, 2013 post, "Is D-Wave Systems Riding the Next Frontier of the Information Age?" Graphic c/o Time. The company made the announcement in the January 29th, 2015 company press release, "D-Wave Systems Raises an Additional $29M, Closing 2014 Financing at $62M." As outlined in the January 29th, 2015 Fortune article, "Quantum Computing Company D-Wave Raises $29 Million CDN," the company has raised a total of $174Mln CDN from a variety of venture and institutional investors including Goldman Sachs, the Business Development Bank of Canada Capital, the Harris & Harris Venture Group, In-Q-Tel (a not-for-profit venture capital firm that invests in high-tech companies for the sole purpose of keeping the US Central Intelligence Agency, and other intelligence agencies, equipped with the latest in technology), Bezos Expeditions (the firm which manages the personal venture capital investments of Amazon chairman and CEO Jeff Bezos) and Draper Fisher Jurvetson. According to the article, the current round of funding was primarily raised by “a large institutional investor,” who asked not to be named. The company indicated that the funding would be used for expansion and to hire more personnel. Two D-Wave quantum computers are currently in operation. The first, built in partnership with Lockheed Martin, is located at the University of Southern California, and the other, built in a partnership with NASA, Google and the Universities Space Research Association, is located at the NASA Ames Research Center. The January 31st, 2015 Next Big Future article, "D-Wave Systems will be commercially releasing a new 1152 qubit quantum annealing system in March 2015," quoted D-Wave director of business development and strategic partnerships Colin P. Williams, as saying that D-Wave will be releasing a "new 1,152-qubit “Washington” processor in March of this year."